The water and sanitations problems for Kiribati, a small island republic on Australia’s side of the International Date Line, are immense. Figures show up to five per cent of newborns die before their first birthday due to illnesses from unclean drinking water. The Island Rescue Project has been trying to fight back by setting up solar powered water desalination equipment and water purifying kits to communities to prevent disease. One project has seen the organisation teaching community-members to make their own household solar-powered desalination units, which can produce adequate clean drinking water for several people. The Island Rescue Project has been giving out LifeStraw filters as well. 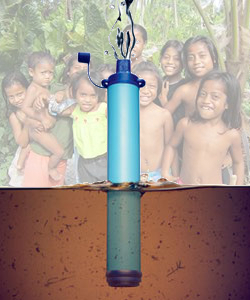 The award-winning device can remove over 99 per cent of parasites by squeezing water through a nano-scale filter. Negotiations are underway for some more permanent help too, with reports that a major water company has pledged to build a commercial-size osmosis desalination plant for Kiribati. For Island Rescue founder Carol Armstrong, the situation in Kiribati is unacceptable. “There really isn't adequate water supplies for the island population,” she told regional news service Pacific Beat. “Often a baby will be born and there's no water to wash the baby, and we can't even comprehend that in our lifestyle. “When one in 20 babies are dying from diarrhoea and other treatable diseases it's just not acceptable in this day and age. Ms Armstrong says the situation has been overlooked by government spending. “They've had a lot of foreign aid but it just doesn't go quite far enough,” she said. With billions of dollars cut from Australia’s foreign aid budget in, it will take increasing independent efforts such as these for the country to do its part in improving the lives and fortunes of the less-equipped.